Enjoyed the interview. Good call on the Heroes Crunchies. 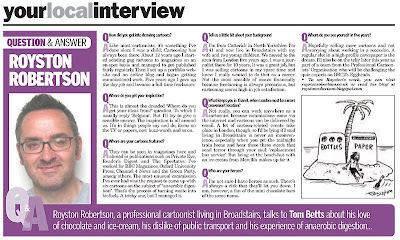 The few interviews I've done have always made me squirm - the last one I did for a Gwent Magazine caught me unawares - the reporter phoned me and made me do the interview as my cartoon character! "So, where would Dai go out for an entertaining evening in Newport"
Silence.. "Um.. er .. ah... the pub?" Lovely! 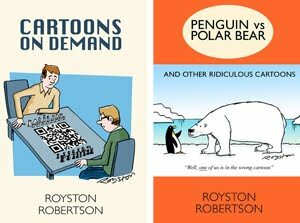 Well done Mr R.
Pushed that woman who couldn't find any custard back into obscurity! Tim, I know what you mean. Luckily this was an email interview so you're relatively in control and the squirm factor is not so high. Having said that, I winced a bit at "dislike of public transport" in the intro. I'm actually a fan of public transport, I only complained about replacement bus services! Clive, that story was actually in a Whitstable paper, though I'm told this will appear in other Kent papers, not just Thanet, so I may edge out Mrs Custard.